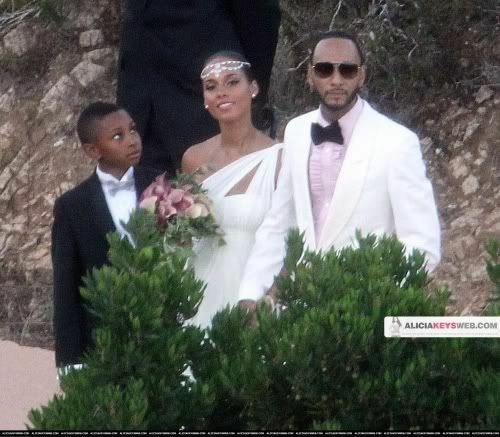 "There was no yacht or over-the-top festivities – just family and close friends as Alicia Keys and Swizz Beatz tied the knot in a private ceremony Saturday in a private home on the Mediterranean Sea. Alicia wore a Grecian-inspired Vera Wang dress and carried a bouquet of purple calla lilies. The groom was decked out in a Tom Ford tuxedo. The couple's friend Dr. Deepak Chopra presided over the nuptials." Swizz beats was also joined by his eldest son who also looked dapper as photogs caught shots of his gazing in amazement at his new beautiful step mom!